Cheese is a fermented milk product made from the curds produced when milk is coagulated. Usually it is made from cow's milk but there are many varieties made from sheep's milk and goat's milk. Cheese can also be made from the milk of various other animals. Real mozzarella, for example, is made from buffaloes' milk. 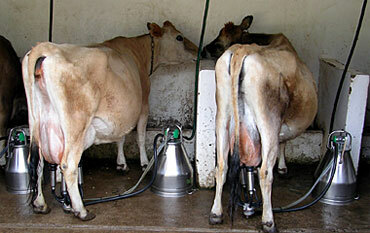 Milk, once in the cheese vat, is warmed to the desired temperature, depending on the type of cheese you make. Fat exists in milk as small globules that can vary in size depending on the breed of cow. The bigger globules will drift to the top and form a cream layer on top of the milk. The fat in the milk helps to produce flavour, aroma and body in mature cheese. Cheese made from skimmed milk is hard in body and texture, and lacks flavour. However, only a small amount of fat (as low as 1%) can produce a background flavour. When milk is coagulated with the help of starter cultures and rennet casein is extracted and processed into cheese as well as other dairy products e.g. yogurt and maas. Whey protein does not coagulate with acid and rennet and is therefore lost in the cheesemaking process. It can be recovered by specialized and expensive filtration methods and spray drying. When hot milk is allowed to stand still for any time, whey proteins appear as a 'skin' on the surface. Whey protein is used in the manufacture of ice cream and sports drinks. It also has healing and anti aging properties. These are organic substances in milk, which help to promote growth. Milk fat holds the fat-soluble vitamins (A, D, E and K) and the water-soluble vitamins are the B complex and C, which are in the whey. They also play an important part in encouraging bacteria to grow in the cheese ripening process. Milk contains a high concentration of calcium and phosphorus, which are important in the building of the skeleton and bone structure. Calcium is probably the most important mineral for the coagulation of milk. This is the main sugar in the milk. It provides the energy source for the starter cultures to produce lactic acid, and so helps to modify the milk for cheesemaking. 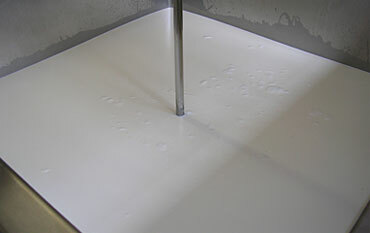 About 10% of the lactose is used by the starter bacteria to make lactic acid, and the rest is drawn off with the whey. Once the milk has reached the desired temperature you add the starter culture. Generally, cheesemaking starts with acidification. This is the lowering of the pH or increasing the acid content of the milk. Classically, this process is performed by bacteria. Bacteria feed on the lactose in milk and produce lactic acid as a waste product. With time, increasing amounts of lactic acid increase the acidity of the milk. Acid is essential to the production of good cheese. However, if there is too much acid in the milk the cheese will be crumbly. If not enough acid is present the curd will be pasty. 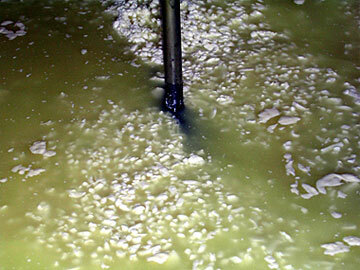 The acid production is carried out by starter cultures. There are two basic categories of starter cultures. Mesophilic starter cultures have microbes that can not survive at high temperatures and thrive at room temperatures. Examples of cheeses made with these bacteria are Cheddar and Gouda. Thermophilic starter cultures are heat loving bacteria. Examples of cheeses made from these bacteria are Swiss and Italian cheeses. Once the right level of acidity is reached, coagulation begins. Coagulation is converting milk into curds and whey. As the pH of the milk changes, the structural nature of the casein proteins changes, leading to curd formation. Essentially, the casein proteins in the milk form a curd that entraps fat and water. Although acid alone is capable of causing coagulation, the most common method is enzyme coagulation. The physical properties of enzyme-coagulated milk are better than that coagulated purely with acid. 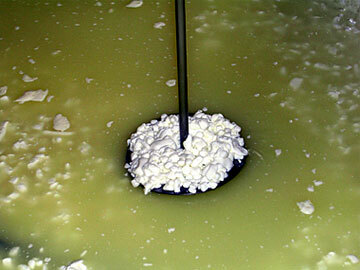 Curds produced by enzyme coagulation achieve a lower moisture content without excessive hardening. Enzymes used to coagulate milk come from a number of sources: animals, plants, and fungi. The traditional source of enzyme is rennet. Rennet is a preparation made from the lining of the fourth stomach of calves. Plants are not really used today, though they are still used in some European countries and the Far East. In Britain, the butterworts, artichokes, teasel, spearwort and thistles are said to have been used, but are usually too mild for general use. Records for the making of rennet go back to the 16th century. The farmer or small-holder cheesemaker would select and slaughter a milk-fed calf, remove and wash the fourth stomach carefully. He would then hang this out to air-dry in which case it would become known as a 'vell'. There was a regular market for dried vells. It is difficult to ascertain how these vells were first used in traditional farmhouse cheesemaking, however, it is most likely that dried pieces of vells were added directly to the milk, and at later times vell extracts in salt solution were used. Basically, sliced or macerated vells were soaked in salty water to provide a solution of enzymes. Filtration may have been used for the purification of the final rennet solution. Storing the rennet in a salt solution keeps it in good condition and suppresses any bacteria that might cause a deterioration in quality. Such rennets are known as 'calf rennets'. 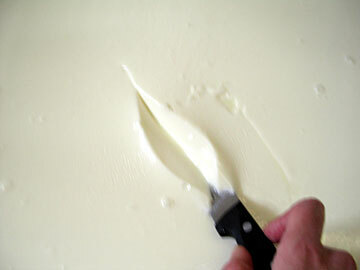 After the coagulation sets the curd, the curd is cut. This step is usually accompanied with heating the curd. 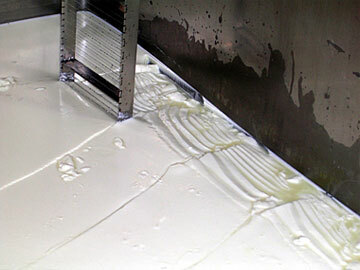 Cutting the curd allows whey to escape, while heating increases the rate at which the curd contracts and squeezes out the whey. The purpose of this stage of the process is to make a hard curd. The term hard curd is relative; the cheese at this stage is still quite pliable. 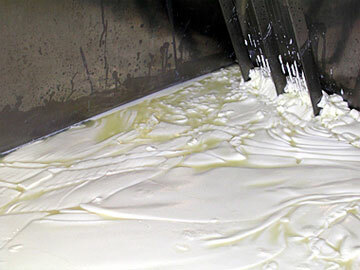 The main difference between a soft curd and a hard curd is the amount of water remaining in the curd. Hard curds have very little water left in them. 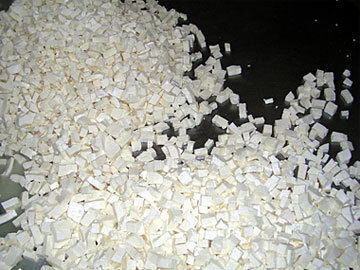 Once the curds have sufficiently hardened, salting and shaping begins. In this part of the process, salt is added to the cheese. 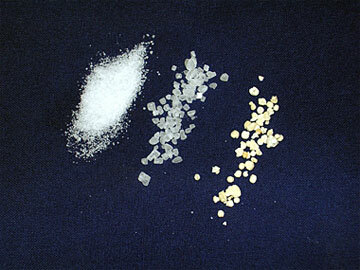 Salt is added for flavor and to inhibit the growth of undesirable microbes. 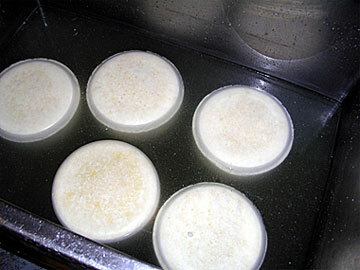 Large curds are formed as smaller curds are pressed together. This will often involve the use of a cheese press. 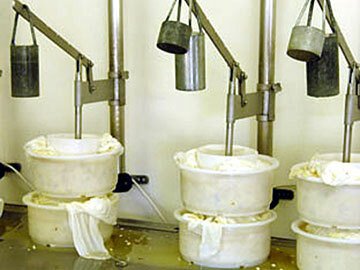 With cheeses like Edam and Emmental no salt is added to the curd before pressing. In this case, the cheese are removed from their mould and tumbled straight into a bath of salt solution strong enough to float the cheese. By holding these cheeses in huge shallow tanks, they start absorbing salt. They are then removed from the brine bath, allowed to dry out by which time the degree of salt needed has spread through them. 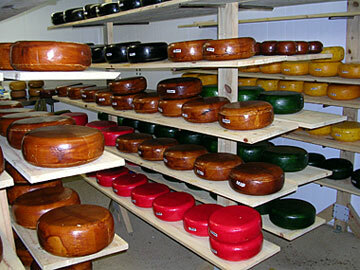 The shaped cheese is allowed to ripen or age for various periods of time. During this time, bacteria continue to grow in the cheese and change its chemical composition, resulting in flavor and texture changes in the cheese. The type of bacteria active at this stage and the length of time the cheese is aged determine the type and quality of cheese being made. Sometimes an additional microbe is added to a cheese. Blue veined cheeses are inoculated with a Penicillium spore, which creates their aroma, flavor and bluish or greenish veining. Cheeses such as Camembert and Brie have their surfaces treated with a different type of Penicillium spore which creates a downy white mould (known as a bloomy or flowery rind): this makes them surface ripened cheeses. 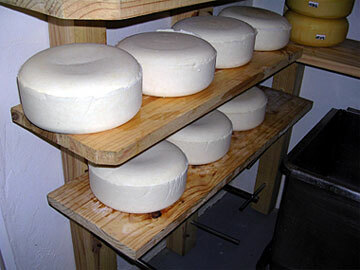 The rinds of the cheeses are formed during the ripening process, many quite naturally. Some are created artificially. 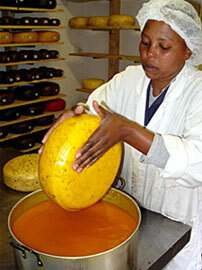 Rinds may be brushed, washed, oiled, treated with a covering of paraffin wax or simply not touched at all. Traditional Cheddars are wrapped around with a cotton bandage. The rind's basic function is to protect the interior of the cheese and allow it to ripen harmoniously. Its presence thus affects the final flavor of the cheese. Salting plays an important role in rind formation. Heavily salted cheeses develop a thick, tough outer rind, typified by the Swiss range of cheeses. Cheddar, another natural rind cheese, is less salted than the Swiss varieties, and consequently has a much thinner rind.